This Mango Pico de Gallo is clean and refreshing. It’s amazing with corn tortilla chips or tacos. 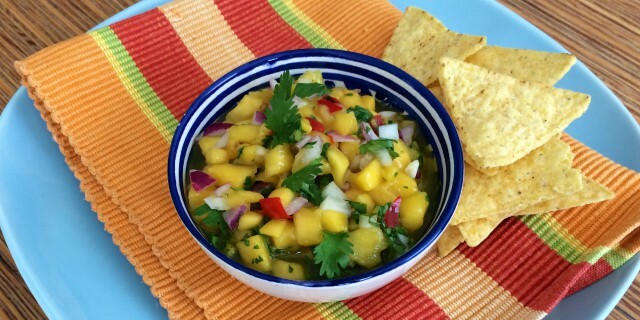 I love the freshness of this fresh mango salsa. Mango, lime and cilantro are some of my favourite ingredients and they work so well together. The juicy and fragrant mango adds a lovely sweetness and adds to all the summer flavours. You can make this salsa ahead of time. By letting it rest, all the different flavours blend together and have time to develop. It’s so delicious! Take the Mango Pico de Gallo with you to the park for a picnic or a barbecue or serve it with homemade tacos. If you enjoy this recipe, you will love this recipe for fresh tomato salsa too. Add all ingredients to a bowl. Set aside and allow to rest for at least 30 minutes so the flavours can develop. Serve right away! You can also make it in advance for dinner the next day. The flavours will have more opportunity to develop so it will be even tastier. Make sure you store the salsa in an air-tight container. One Response to "Mango Pico de Gallo"